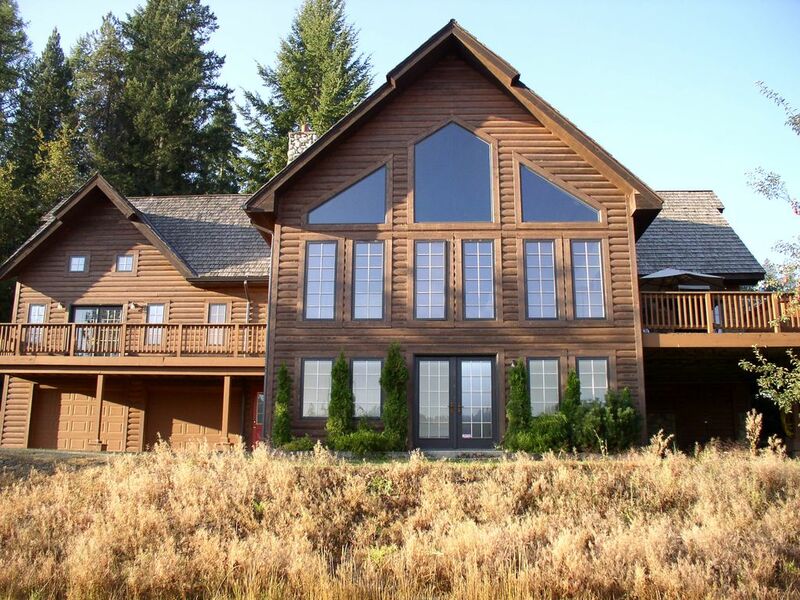 This 4,830-square-foot, lakefront chalet is situated on over 11 acres and features 180-degree lake and mountain views from nearly every room! It will accommodate up to 15 people in beds (I will allow 20 people max) with five bedrooms and three bathrooms on two floors, plus an 800-square-foot loft with king size bed, a full size bunk with single on top. It is the perfect location for weddings and family reunions. I have had many of both over the years. I always receive nice cards and letters from the people that have stayed here telling me what a nice time their family had, how beautiful the house is and how they can't wait to return again the following summer. I provide only quality furnishings, linens, towels, soaps, toilet paper, appliances and utensils. I have high end front loading washer and dryer on site. I pride myself on keeping the home spotless for each rental. The grounds are always well groomed. The home also features hardwood floors, a river-rock fireplace in the living room, open kitchen and dining room with water views. The cedar tongue-and-grove cathedral ceilings add a warm and cozy feel. The very large master suite has two-story-high cathedral ceilings, a private deck over looking the lake, a gas fireplace and a private jacuzzi tub in the large master bath suite. There is another large deck off of the living room with a hot tub, patio table, gas barbecue and great views of the lake. The house also has it's own private boat dock, sandy beach with fire pit and picnic table. Very private Rose Lake is ideal for water skiing, wake boarding, fishing and boating. Most of the time you will have the lake to yourself. The water is very calm and ideal for all water sports. There is also another boat ramp less than two miles from the house that will let you access Lake Coeur d' Alene if you bring your own boat. The house is also close to hiking, biking and snowmobile trails, as well as numerous area golf courses. It is less than 15 minutes away from Silver Mountain Ski resort and it's famous World's Longest Gondola. Look Out Pass Ski Resort is only 45 minutes east in Montana with the best snow and best daily lift rates around! Silver Mountain Resort opened a brand new water park and wave machine in 2008. Silver Mountain also offers Mountain Bike rentals for use on several of the areas bike trails. They also have Downhill bikes for those who dare to take the Gondola to the top and descend Silver Mountain. Also nearby is Silverwood Theme Park, another well known area attraction for the family and kids about 45 minutes drive from the house. This home is located less than 22 minutes from Coeur d' Alene and 55 minutes from Spokane International Airport. Central air conditioning was added to the home in 2007 for those extra hot summer days! Thank you! This is a lovely home. Lots of space, great spaces for gathering a group. One thing I would note that isn't obvious from the listing is that the 6 bedrooms listed include the loft and one basement bedroom that you have to access through another bedroom. The home was very well maintained, except for the hot tub which didn't work while we were there. (but I never called about it, so it could just be a maintenance issue). The location is amazing on this beautiful small lake, one of a kind. I'm sure it would be even nicer in the summer when you could use the deck and enjoy the lake and didn't have to deal with snowy parking challenges. I kept the hot tub running all winter so it would be available for this guest, usually it would have been winterized. February was the coldest month here in Idaho. I went over the day the guest was arriving to turn up the temperature on the hot tub and it had not completely gotten up to temperature when the guest wanted to use it. If she had called me I would have explained that the hot tub needed more time to get up to full temperature. The scenic location is ideal for access to the Trail of the Coeur d' Alenes. We rode out/back east from the Bull Run trailhead to Kingston and out/back west from the Medimont trailhead to Heyburn. We also rode Route of the Hiawatha. Our 10 people (5 couples) were quite comfortable, making good use of the variety of sleeping arrangements and other amenities. A special treat was sharing pears that were falling off a tree in the yard with some whitetail deer. We had 5 couples for a long week-end, The home was perfect to hang out,play some cards so a bon fire at the beach and enjoy the home. The mastersuite is awesome, the bed was so comfortable. The home really accomodates a large group well. It was well stocked in dishes and towels. Hot tub on the deck overlooking the lake and the stars at night was really nice. We had dinner one night at the Wolf Lodge, it was really good and all the county decor was fun! Perfect balance of relaxation and fun! I have to say that we got so much more than we expected during our stay at Rose Lake Lodge! The house was beautiful with extra large rooms and comfortable furnishings including a dining table that easily accommodated our group of 12 adults and two children. The abundance of towels along with a well-stocked kitchen makes it clear that the owner truly makes his lodgers comfort a priority. The views from every window were amazing! Sitting on the decks or in the hot tub marveling at the scenery never got old. Our favorite spot was the beach, where there was plenty of sand for my grandchildren to build sand castles while the grownups made use of a great fire pit and a dock just perfect for fishing or launching our water toys from. The location of Rose Lake Lodge is another big plus. Just minutes from the interstate, it feels secluded with its own private lake. And since it is located between Kellogg and Coeur d’alene, when we felt like exploring, there were lots of things to do in every direction. It’s not far from Silverwood amusement park or several other water parks in the area. We rode the gondola in Kellogg, (the more adventurous went mountain biking) and we also took the last Sunday Brunch cruise of the year on Coeur d’Alene Lake, all of which were enjoyable. In short, we had a vacation to remember at Rose Lake Lodge and I highly recommend it to anyone looking for a vacation centered around relaxation and fun! We loved the lake, and the house was very comfortable. The only thing that would have made this better would be a second week! Thanks Hartley, we hope to return someday! The Rose Lake Lodge was perfect for our family reunion. The easy access to the lake front with private beach and dock made for readily available activities for both adults and children alike. The kids were able to catch blue gill, bass, and perch all day long, and day after day, right from the dock. The water is also shallow even beyond the dock allowing for safe(r) swimming for young children. The kitchen is large and open with plenty of seating between the kitchen and the deck. The availability of the washer and dryer was key given the 7 night minimum stay in the summer. We enjoyed our time so much, there was talk of a future return stay.